I promised you more Brusho…here’s another idea! I was asked to provide a sample for this month’s Pinsights challenge (see details below in this post)….and the inspiration flowed! 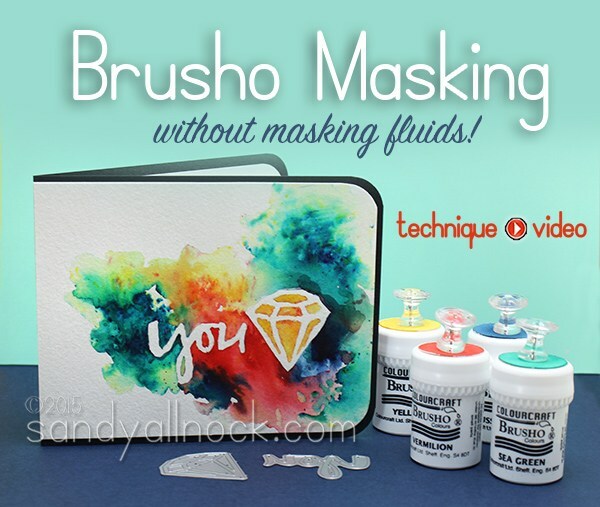 Brusho Masking – without masking fluid! One of the special features of watercolor powder is that it doesn’t actually turn into paint until it’s wet. I decided to use that property intentionally to create a one-layer card by just painting with water – it worked beautifully! Watch the video below, or click HERE to see it in HD on YouTube. Wasn’t that just fun to watch the Brusho move within the watery areas – and leave the unpainted areas alone? My card was made for the The Essentials by Ellen Pin-Sights challenge for September…and I thought the inspiration board was really interesting! 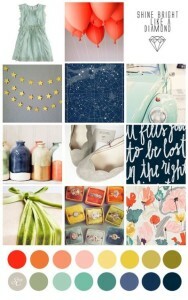 It’s fun to see how someone chose colors and textures that went together, and pulled together a palette of colors from the items in the photographs. You can join in too! The monthly Pinsights Challenge is based on a Pinterest-inspired photo, and the challenge is held on the CLASSroom blog. A random challenge participant will receive a $50 gift certificate to the Ellen Hutson store! How awesome is that? To be eligible, you MUST use Essentials by Ellen products and the photo at the right as inspiration. (see it larger over on their blog HERE.) There will be an inlinkz on the challenge post where you can submit your entry! Gorgeous card Sandy. I really like the look of the brusho but have a lot of money invested in copics so I don’t feel I can switch gears right now. Thanks for sharing with us. You are killing me with these Brushos!! I cannot cave and buy them because they are so expensive!! I LOVE all the cards and fun techniques you are using with these, though!! 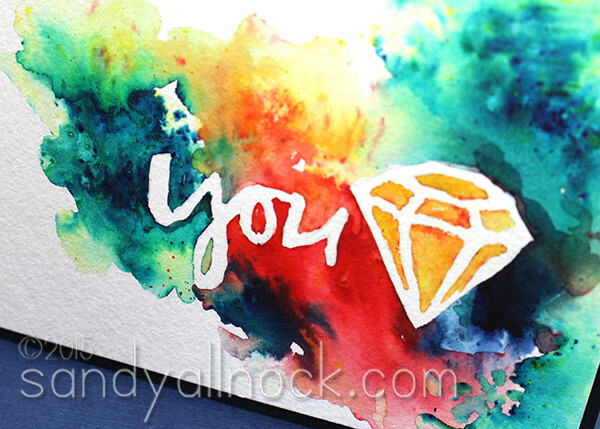 Love your video…very neat and colorful card! That’s such a gorgeous card! Perfect for the Pinsights images. I love how this turned out and enjoyed seeing how it was done. You rock Sandy! Sandy another stunning video, but you really out did yourself this time. I think it’s amazing that you are doing a “Pin”sights challenge and managed to get a “push pin” image just over the top of the “you”. Sandy you rock as well on all your cards. I finally caved and ordered some Brusho’s earlier this week. Hopefully they’ll be here by Saturday. I only got a few colors instead of a set. Thanks for providing another idea for using this product.